We report a case in which cerebral oximetry was used to optimize brain perfusion in a patient receiving extra-corporeal cardiopulmonary resuscitation (eCPR) after out-of-hospital cardiac arrest (OHCA). A 52-year-old woman (height of 165 cm and weight of 67 kg) had an OHCA secondary to acute myocardial infarction. The ambulance arrived on the scene 10 minutes after the call, and mechanical CPR (Lucas; Physio Control Inc., Brussels, Belgium) was initiated. She was finally transferred to our hospital with ongoing CPR 50 minutes after the initial call. Monitoring of frontal oxygenation (Foresight; Casmed, Branford, CT, USA; normal values of greater than 65%) was started, and tissue hemoglobin saturation (StO2) values of around 30% were shown during CPR (Figure 1). A right radial artery catheter was inserted and an extracorporeal membrane oxygenation (ECMO) veno-arterial device was placed in the femoral vessels within 30 minutes after admission. Just after initiation of ECMO (with blood flow of 3 L/minute, sweep gas flow of 10 L/minute, and fraction of inspired oxygen (FiO2) of 100%), the mean arterial pressure (MAP) was 67 mm Hg, temperature was 33°C, arterial partial oxygen pressure (PaO2) was 78 mm Hg, blood lactate was 10 mEq/L, and StO2 had increased to 47% bilaterally. After 4 minutes with persistently low StO2 values, we increased the ECMO blood flow to 3.5 L/minute, which resulted in increases in MAP to 73 mm Hg, PaO2 to 83 mm Hg, and StO2 to around 60%. Arterial lactate levels were still very high (9.5 mEq/L), and the patient had mottled skin. The ECMO blood flow was then increased to 4 L/minute, which resulted in increases in MAP to 83 mm Hg and StO2 to greater than 75% in both hemispheres. Despite recovery of spontaneous cardiac activity, the patient died from severe hypoxic-ischemic encephalopathy and multiple organ failure. Evolution of cerebral oxygenation as measured by cerebral oximetry over time. Ch1, left side; Ch2, right side; ECMO, extracorporeal membrane oxygenation; mCPR, mechanical cardiopulmonary resuscitation; StO2, tissue hemoglobin saturation. Brain damage remains the most important cause of morbidity and mortality among survivors after cardiac arrest. However, it remains unclear how systemic hemodynamics should be adjusted to ensure adequate cerebral oxygenation. Cerebral oximetry has been used to optimize cerebral perfusion during conventional CPR , and very low cerebral saturation (<40%) may predict poor neurological outcomes at hospital discharge in patients with OHCA . ECMO has been shown to be effective to resuscitate adult patients following refractory cardiac arrest with intact neurological outcomes in 15% to 30% of cases [3, 4]. Nevertheless, only scarce data are available on the adequacy of cerebral oxygenation during eCPR, and most of them focus on pediatric patients. In one retrospective study, Wong and colleagues  described their experience with cerebral oximetry monitoring in 20 adult patients with ECMO; in this population, low cerebral saturation occurred in all patients and was corrected in 80% of them by various interventions to optimize brain perfusion, including increasing MAP or ECMO blood flow . In our patient, cerebral saturation remained very low during CPR and only just exceeded 40% with initial ECMO settings, and both of these factors probably were implicated in the irreversible brain damage. 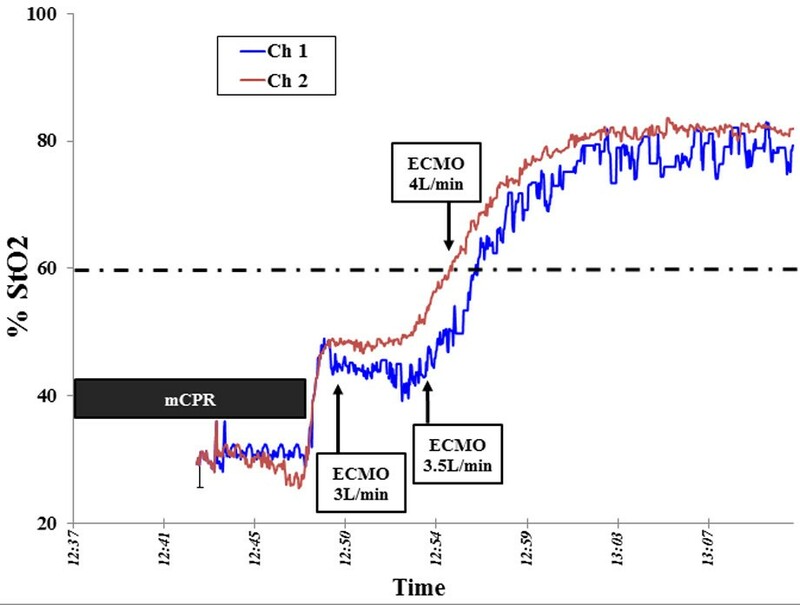 We suggest that cerebral oximetry be used to rapidly adjust ECMO blood flow to provide adequate brain oxygenation in patients undergoing eCPR. The impact of such an approach on outcomes warrants further evaluation. We have obtained consent from the patient's family to publish these data. DF, DdB, and BR were directly involved in the medical management of the patient. FST was responsible for cerebral oximetry monitoring. All authors contributed to the preparation of the manuscript and read and approved the final version.